Author-illustrator of Little Gorilla and numerous other children’s book. Ruth is also a dedicated painter and visual artist. 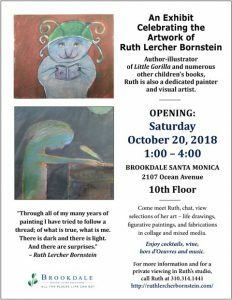 Come meet Ruth, chat and view a selection of her art — original illustrations, life drawings, figurative paintings, and fabrications in collage and mixed media.